Porous pavement is a paved surface with a higher than normal percentage of air voids to allow water to pass through it and infiltrate into the subsoil. This porous surface replaces traditional pavement, allowing parking lot, driveway, and roadway runoff to infiltrate directly into the soil and receive water quality treatment. 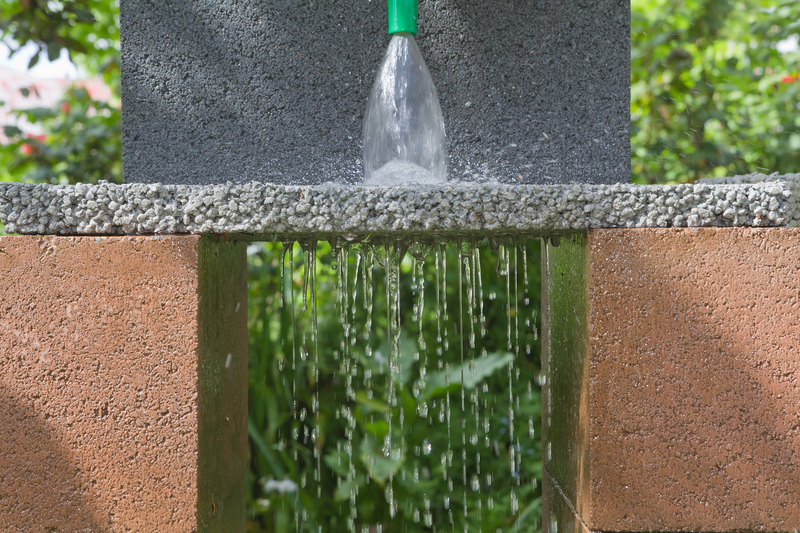 All permeable paving systems consist of a durable, load-bearing, pervious surface overlying a stone bed that stores rainwater before it infiltrates into the underlying soil. Permeable paving techniques include porous asphalt, pervious concrete, paving stones, and manufactured “grass pavers” made of concrete or plastic. Permeable paving may be used for walkways, patios, plazas, driveways; parking stalls, and overflow parking areas. 2 - Peak Flow Provides peak flow attenuation for small storms. 3 - Recharge Provides groundwater recharge. 4 - TSS Removal 80% TSS removal credit if storage bed is sized to hold ½-inch or 1-inch Water Quality Volume, and is designed to drain within 72 hours. 5 - Higher Pollutant Loading Not suitable. 6 - Discharges near or to Critical Areas Not suitable, especially within Zone II or Zone A of public water supplies. Improved site landscaping benefits (grass pavers only). Can be used as a retrofit when parking lots are replaced. Prone to clogging so aggressive maintenance with jet washing and vacuum street sweepers is required. No winter sanding is allowed. Winter road salt and deicer runoff concern near drinking water supplies for both porous pavements and impervious pavements. Soils need to have a permeability of at least 0.17 inches per hour. Special care is needed to avoid compacting underlying parent soils. Most appropriate for pedestrian-only areas and for low-volume, low-speed areas such as overflow parking areas, residential driveways, alleys, and parking stalls. Porous pavement, also known as permeable paving, is appropriate for pedestrian-only areas and for low-volume, low-speed areas such as overflow parking areas, residential driveways, alleys, parking stalls, bikepaths, walkways, and patios. It can be constructed where the underlying soils have a permeability of at least 0.17 inches per hour. Porous paving is an excellent technique for dense urban areas, because it does not require any additional land. Porous pavement can be successfully installed in cold climates as long as the design includes features to reduce frost heaving. Porous paving is not appropriate for high traffic/high speed areas, because it has lower load-bearing capacity than conventional pavement. Do not use porous pavement in areas of higher potential pollutant loads, because stormwater cannot be pretreated prior to infiltration. Heavy winter sanding will clog joints and void spaces. On some highways, MassHighway Department uses an Open Graded Friction Course (OGF) that has a permeable top coat but an impermeable base course. MassDEP provides no Water Quality or Recharge Credit for OGC, because it does not provide treatment or recharge. The primary benefit of OGF pavements is reductions in noise and hydroplaning. Porous pavement provides groundwater recharge and reduces stormwater runoff volume. Depending on design, paving material, soil type, and rainfall, porous paving can infiltrate as much as 70% to 80% of annual rainfall. To qualify for the Water Quality and Recharge Credits, size the storage layer to hold the Required Water Quality or Required Recharge Volume, whichever is larger, using the Static Method, and design the system to dewater within 72 hours. Porous pavement may reduce peak discharge rates significantly by diverting stormwater into the ground and away from pipe-and-basin stormwater management systems, up to the volume housed in the storage layer. Grass pavers can improve site appearance by providing vegetation where there would otherwise be pavement. Porous paving can increase the effective developable area of a site, because the infiltration provided by permeable paving can significantly reduce the need for large stormwater management structures. Porous paving must not receive stormwater from other drainage areas, especially any areas that are not fully stabilized. Use porous paving only on gentle slopes (less than 5%). Do not use it in high-traffic areas or where it will be subject to heavy axle loads. Bedrock	As with any stormwater exfiltration system, determine if it is feasible in locations with high bedrock. Presence of bedrock near land surface reduces the ability of soils to exfiltrate to groundwater. Porous paving reduces the need for other stormwater conveyances and treatment structures, resulting in cost savings. Permeable paving also reduces the amount of land needed for stormwater management. Porous asphalt and pervious concrete. Although it appears to be the same as traditional asphalt or concrete pavement, it is mixed with a very low content of fine sand, so that it has from 10%-25% void space. Paving stones (also known as unit pavers) are impermeable blocks made of brick, stone, or concrete, set on a prepared sand base. The joints between the blocks are filled with sand or stone dust to allow water to percolate to the subsurface. Some concrete paving stones have an open cell design to increase permeability. Grass pavers (also known as turf blocks) are a type of open-cell unit paver in which the cells are filled with soil and planted with turf. The pavers, made of concrete or synthetic material, distribute the weight of traffic and prevent compression of the underlying soil. Each of these products is constructed over a storage bed. a reservoir course of uniformly graded crushed stone with a high void content to maximize the storage of infiltrated water and to create a capillary barrier to winter freeze thaw. The bottom of the stone reservoir must be completely flat so that runoff can infiltrate through the entire surface. The size of the storage bed may have to be increased to accommodate the larger of the Required Water Quality and the Required Recharge Volume. If paving stones or grass pavers are used, a top course of sand that is one inch thick should be placed above the choker coarse. Some designs incorporate an “overflow edge,” which is a trench surrounding the edge of the pavement. The trench connects to the stone reservoir below the surface of the pavement and acts as a backup in case the surface clogs. Care must be taken in batching and placing porous asphalt. Unless batched and installed properly, porous pavement may have a reduced exfiltration ability. At Walden Pond State Reservation, several of the areas paved with porous asphalt did not meet the target exfiltration rate. Cores were taken and it was found that the batches had more sand and/or asphalt than was specified, and those sections had to be removed and repaved. It is critical to minimize the amount of asphalt binder. Using greater amounts of asphalt binder could lead to a greater likelihood of “binder” or asphalt drawdown and clogging of voids. Sun light heating can liquefy the asphalt. The liquefied asphalt then drains into the voids, clogging them. Such clogging is not remedied by power washing and vacuuming. The topcoat in such instances needs to be scarified and resurfaced. The University of New Hampshire has prepared detailed specifications for preparing and installing porous asphalt that are intended to prevent asphalt problems. Provide an open-graded subbase with minimum 40% void space. Generally, do not use porous pavement for slopes greater than 5 %. Do not place bottom on compacted fill. Provide a three-foot buffer between the bed bottom and the seasonal high groundwater elevation, and a two-foot buffer for bedrock. Porous pavement performs well in cold climates. Porous pavement can reduce meltwater runoff and avoid excessive water on the road during the snowmelt period. In cold climates, the major concern is the potential for frost heaving. The storage bed specifications prepared by the University of New Hampshire address this concern. In most porous pavement designs, the pavement itself acts as pretreatment to the stone reservoir below. Consequently, frequent cleaning and maintenance of the pavement surface is critical to prevent clogging. To keep the surface clean, frequent vacuum sweeping along with jet washing of asphalt and concrete pavement is required. No winter sanding shall be conducted on the porous surface. Minimize salt use during winter months. If drinking water sources are located nearby (see setbacks), porous pavements may not be allowed. Keep landscaped areas well maintained to prevent soil from being transported onto the pavement. Regularly monitor the paving surface to make sure it drains properly after storms. Never reseal or repave with impermeable materials. Periodically reseed grass pavers to fill in bare spots. Attach rollers to the bottoms of snowplows to prevent them from catching on the edges of grass pavers and some paving stones. The Nonpoint Education For Municipal Officials program at the University of Connecticut has been involved in numerous permeable paving pilot projects. Adapted from: MassDEP, Massachusetts Nonpoint Source Pollution Management Manual, 2006.